Say NO to Silicone Caulking! Paint will not stick to silicone caulking. Period. End of discussion. Completely remove the silicone caulking. Dig, cut, scrape, or use a chemical remover to eradicate all traces of silicone. After complete removal wipe down the area with denatured alcohol and re-caulk with a paintable caulking. The quick and dirty way is to wipe it down with denatured alcohol, prime over the top of it with some aresoled primer, and paint over it. These method is temporary because the paint is floating ontop of the silicone and has not bonded to the substrate. 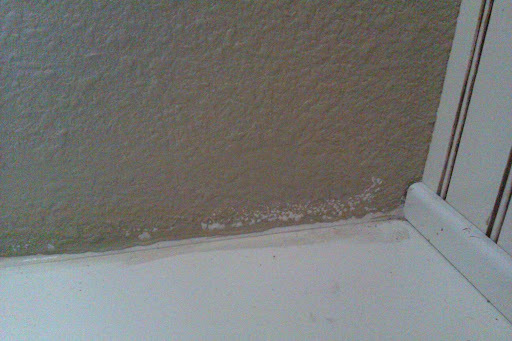 Caulking over the top of the silicone with a paintable caulking yields sub-par results. This method works better than priming. Your chances of success will greatly improve if you use a paintable siliconized adhesive caulking. The best method is to avoid silicone all together. It doesn’t have a place in the painting world. There are a few places silicone could be used around the house i.e. around tub spouts, sealing a sink on a countertop. If paint will ever come into contact with the caulking use a paintable caulking and avoid the mess of cleaning up silicone.